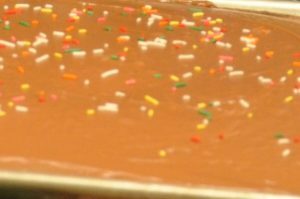 This classic chocolate sheet cake is an eggless version that I have been making in my Gram's kitchen since I was about 8 years old. I'd hate to think how many I've made in the past 4 decades - not nearly as many as my Gram in her lifetime. In a large mixing bowl, combine flour, sugar, cocoa, baking soda, and salt. Mix well. With a spoon, make three holes or wells in the dry mixture, one larger than the other two. In the smaller holes, pour the vinegar and the vanilla. In the larger hole, pour the oil. Be sure to not let any liquids touch during this part of the recipe. Pour 2 C cold water over entire mixture and blend at least 50 strokes or with a hand mixer. 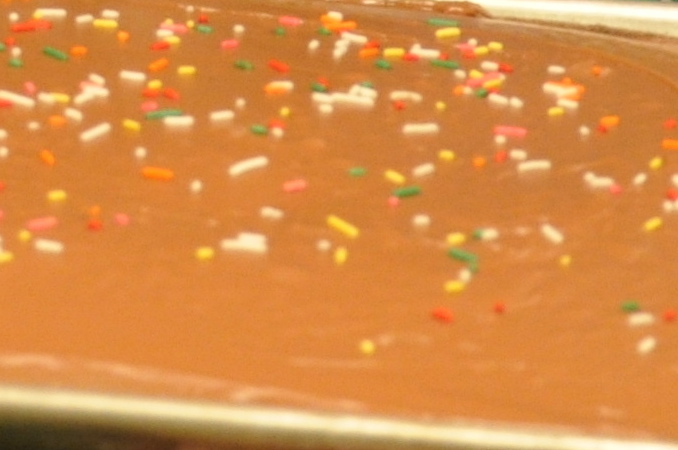 Pour into a greased sheet cake pan. Bake at 350•F for 30 minutes. Cool. In a small saucepan, melt the butter. Whisk in cocoa and half-n-half. Stirring constantly, bring to a boil. Boil for one minute while stirring. Remove from heat and add vanilla. Immediately add powdered sugar and beat with an electric hand mixer until icing is smooth. While icing is still runny, pour over complete cool sheet cake. This is the time to add sprinkles. Icing will set up over the next 10 minutes or so. You don’t mention the size of the sheet cake pan in your recipe.? what size is it. I was excited to find you while searching for recipe books for microwave/convection ovens. We just upgraded our motor home and the new one has the microwave/convection combination instead of a regular oven. I haven’t found a recipe book in the papers, so I’m anxious to find recipes. Please include me in any new recipes and tell me how I can find some of your others. Thank you! !